How can you improve the air quality inside your home? 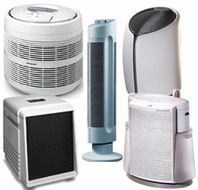 What kinds of air cleaners are there? What is an air cleaner's CADR rating? Why does an air cleaner need a pre-filter? If you have a question about air cleaners that is not covered here, please e-mail us at and we will do our best to answer it. The air you breathe is not pure. It may contain thousands of chemical and biological substances emitted into the atmosphere by natural sources (e.g. forest fires) or human activities. In addition, these chemicals may react in the atmosphere to produce other pollutants. Particles and gases in the air can be a source of lung irritation. Chronic exposure to pollutants in the air can damage deep portions of the lung even after symptoms such as coughing or a sore throat disappear. If you have asthma or allergies, their symptoms can be caused or even worsened by air pollutants. However, an average person spends about 90% of his or her time indoors. Thus, the air quality indoors is almost certainly more important than outdoors. While you might expect that the air that you breathe inside your home is relatively clean, it still contains a good measure of pollutants. These may be tiny dust particles raised in the air as you move around the house, dander from any pets you might have, tobacco smoke (if you have smokers in the house), odors from the kitchen, bathroom, combustion from heating and cooking, fumes and particles coming from furniture and building materials, etc. The quality of indoor air depends both on the strength of emissions of indoor sources and on the quality of outdoor air. In most inhabited spaces there is a continuous exchange of air with the outside. As a result, all contaminants of outdoor air are likely to be present indoors. No matter how thoroughly cleaned your home might be, pollutants are still constantly introduced into the air from various indoor and outdoor sources. Therefore, you need them to be as constantly removed from the air as they are introduced. If you live in an urban area, simply airing the room would not help, since this only opens the path for more pollutants to enter your home. Air cleaners are designed to do just that: remove the pollutants from the air. Different models have different cleaning capabilities and are designed to work in rooms of different sizes. Some have the capability to clean the air in several rooms at once or even in your whole home. Some can capture odors as well as particulates. Some air conditioners also have air cleaning capabilities, so you can have cool and clean air coming from one appliance. Filtering air cleaners pass the air through a cartridge that contains material with extremely small pores, just enough to let the air pass and trap the particulates inside. The best filters, called the HEPA (High Efficiency Particulate Arrestor) filters can trap up to 99.97% of particles down to 0.3 microns. The drawback of filtering air cleaners are that they are slightly noisy. Also, the filter pores eventually get clogged with dust trapped from the air, reducing it's effectivity. That is why it is advisable to replace your air cleaner's filter at least once a year. Electrostatic (ionic) air cleaners electrically charge the particles in the air that passes through them. The charged particles are then attracted to a series of flat plates with an opposite electrical charge. These air cleaners effectively remove particulate from the air, such as allergens (including mold and dust mites), fine dust particles, bacteria, viruses, chemical fumes and other ultra-fine particles. Their main drawback is that they produce a certain amount of ozone, that can be damaging to lungs. CADR, or the Clean Air Delivery Rate, is an industry rating that measures the amount of clean air produced by an air cleaner. Expressed in cubic feet per minute (CFM), it shows how well an air cleaner reduces pollutants such as tobacco smoke, pollen and dust. The higher the CADR rating, the faster the unit filters the air. HEPA (High Efficiency Particle Arrestor) filters were originally designed to trap microscopic particles such as radioactive dust in atomic plants and are commonly used for critical environments like hospitals, clean rooms and lead abatement projects. They consist of a sheet made of thin fibers folded in an accordion fashion - this allows a larger filtering area. HEPA filters can trap up to 99.97% of particles down to 0.3 microns and can be 95-99% effective at capturing particles below 0.3 microns in size. Since HEPA filters eventually clog with dust collected from the air, it is advised to replace them at leat once a year. Pre-filters are the filters with larger pore sizes that are usually placed before the HEPA filter. Their function is to filter out larger particles that can damage the fragile fibers that make up the HEPA filter. Pre-filters greaty improve the life time of HEPA filters. Some of them may be treated to absorb odors. It is advised to replace the your air cleaner's pre-filter once in every three to six months.